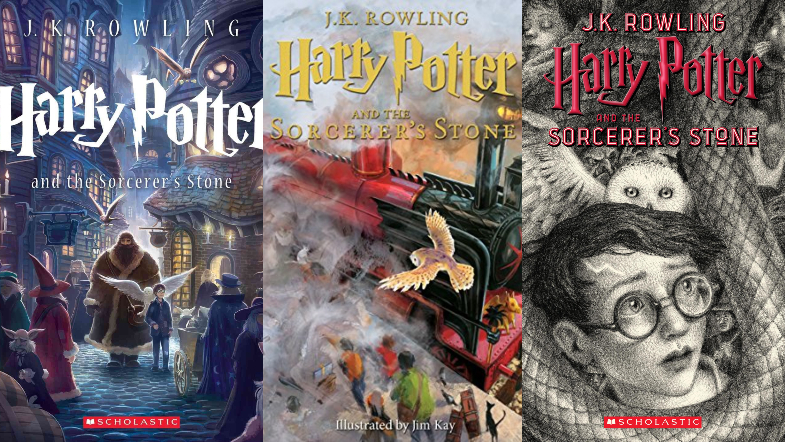 Over the years, the Harry Potter books have worn too many beautifully illustrated covers to count. At San Diego Comic Con over the weekend, three of the artists who’ve had that honor convened for the panel ‘Harry Potter: 20 Years of Magic’ to share their processes. Here’s what we learned from each of them! Kazu Kibuishi is the artist behind the 15th anniversary covers. Every cover went through about 100 variations! Scholastic was very impressed with the Prisoner of Azkaban cover – after seeing it, they asked Kibuishi to do the rest in a similar style. All the covers were digitally painted. Several real people were slipped into the background of the Diagon Alley scene on the box art, including Kibuishi himself, his wife, his assistant, and J. K. Rowling. Kibuishi says that “in some ways, Harry Potter saved my life” – it was his first project after a serious illness that rendered him temporarily comatose. Jim Kay has the monumental task of illustrating the Harry Potter series – not just covers, but hundreds of illustrations, everything from small images of a particular object or character to stunning scenes taking up a whole page, or even a two-page spread. He actually built a scale model of Hogwarts out of wood, wool, clay, and discarded paper in order to get the lighting just right for his illustration. Kay’s version of Hogwarts is less structurally sound than the castle we see in the movies – his goal was to create a version in which the magic of the school was deeply intertwined with the actual building, looking like it is literally being “held up by magic”. The responsibility of such a gargantuan task made him panic – he says he was terrified of ruining Harry Potter. Only the first three books are completed so far, but all seven will be fully illustrated by the time Kay is through! Brian Selznick created all-new covers for the 20th anniversary. During the project, he worked thirteen hours a day. Selznik listened to Jim Dale’s audiobook recordings of the series as he worked. He started the first book when he began work, he says, and ended up reaching the Battle of Hogwarts just as he got to the point of drawing Harry and Voldemort on the final cover. Dumbledore’s face on the cover for Half-Blood Prince was based on Michelangelo’s statue of Moses. The 20th anniversary editions will hit stores August 28th!